2018 was a busy year for employment law. We’re all finding ways to comply and we’re doing it in a period when the talent pool is the smallest it’s ever been. Now is not the time to shy away from using temporary employees, contractors, or independent contractors. If you do, you might end up with a lot of unfilled jobs. While the nature of work is changing rapidly in our “New” Economy, companies should not ignore the issues of Co-Employment and Independent Contractor compliance. In the area of co-employment, the National Labor Relations Board (NLRB) issued a proposed rule last September that would reverse the NLRB’s 2015 Browning-Ferris Industries decision and clarify the standard for joint employment. The comment period for the proposed rule closed on December 13, 2018, and a final ruling is expected sometime in 2019. We want to help you gain the knowledge and understanding you need to ensure your organization is up-to-date on traversing the realities of co-employment and worker classification in the new economy. Denis Kenny, Attorney and Partner with Scherer, Smith, and Kenny, and Connie Wendt, VP Compliance & Relations, ClearPath Workforce Management, will be co-hosting a webinar, Ignorance Is Not Bliss: The Realities of Co-Employment & Worker Classification in the “New” Economy. We’ll look at the Co-Employment and Worker Classification landscape and recent legislative updates that could affect your organization. This webinar is designed to provide you with an overview of the issues surrounding co-employment and worker misclassification, understanding the landscape, and what you can do about mitigating your risk. ClearPath Workforce Management risk mitigation services bridge the gaps where fear of risk may prevent engagement of top talent. 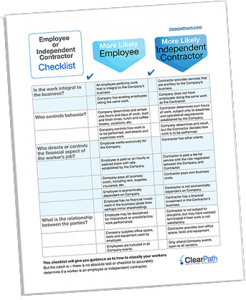 ClearIC™ can automate and simplify the Independent Contractor evaluation process while mitigating your risk. ClearPath has partnered with Scherer, Smith & Kenny LLP since 2001. We highly recommend this firm, as they are easy to work with and very responsive. If you have any legal questions, you can contact Denis Kenny at dsk@sfcounsel.com, Ryan Stahl at rws@sfcounsel.com, or John Lough, Jr. at jbl@sfcounsel.com.